How we you know that Paul Ryan's RNC speech was completely full of lies? Because even an op-ed posted on Fox News has denounced him for it. To anyone paying the slightest bit of attention to facts, Ryan’s speech was an apparent attempt to set the world record for the greatest number of blatant lies and misrepresentations slipped into a single political speech. On this measure, while it was Romney who ran the Olympics, Ryan earned the gold. The good news is that the Romney-Ryan campaign has likely created dozens of new jobs among the legions of additional fact checkers that media outlets are rushing to hire to sift through the mountain of cow dung that flowed from Ryan’s mouth. Said fact checkers have already condemned certain arguments that Ryan still irresponsibly repeated. Elections should be about competing based on your record in the past and your vision for the future, not competing to see who can get away with the most lies and distortions without voters noticing or bother to care. Both parties should hold themselves to that standard. 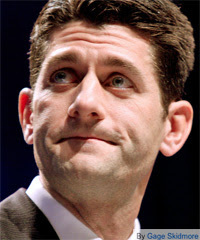 Republicans should be ashamed that there was even one misrepresentation in Ryan’s speech but sadly, there were many. "World record for lying." Remember that one.